The Original Breeze Cap is made from naked tanned cowhide. Similar to the “kango” style, but no brim! Like a soft shaped tam with the swoop in the back. The Breeze Cap has no brim to hit your collar or catch the wind. So soft you can ball it up in your pocket when not wearing it. I Just Got My New Hat And I'm Wearing It Right Now. It Fits Perfectly, Thank You Very Much. I Love It Already!" Order your Original Breeze Cap today on-line! Please allow 3 weeks for delivery! "I just wanted to pass along my compliments on your Leather Hat. The hat feels great and packs ups nicely. 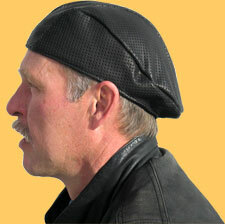 I was going home the other day on my Harley, looked down and was doing about 90 mph, the hat never budged. It is so light that it felt like I did not have one on at all.
' Thanks' for a Great Product. Have a Great Day!" You have to feel these! "Your hats are comfortable the first time you put them on, and they get even more comfortable with time. I literally wear mine every single day. The headband liner and elastic you use are of obvious high quality, because the fit is just perfect after lots of wear...it doesn't lose fit quality over time. The leather you use is really soft, but it holds up extremely well, and gets softer with use. Best of luck with this item, because you have a winner with it!" My name is Kurt Hueneke and I ordered two Breeze Caps on the 6th. One solid leather, and one half perforated. I received them on the 8th and they are the best. You are one of the best and fastest merchants I have dealt with on The Internet. I am sure I will buy from you again. Thanks again for an excellent product." I feel inspired! Just received the breeze cap I ordered and it is great. Knowing the quality of your work, I had to have the cap. Forget the 83 MPH. I ride with a bunch of ex airline jockeys and we love to push our Harleys. Let's just say I "tested" the cap at 90 plus and it stuck like glue! Thanks again for another great design and a well made product . Now I need one in another color." "I got my hat today. WOW! WOW! WOW! It is simply awesome! The size is absolutely perfect! Okay...now I have to have the partially perforated one...kinda half and half...the one you call the combo, I believe. You do simply incredible work!" 20 3/4" - 21 5/8"
US = 7 1/2 - 7 3/4"
inches = 23 3/8" - 24 1/2"
Colorado residents charged 8.125% sales tax.